A-part-of mobile-users don’t wish to track their mobile phone location and they want to keep aside secret. To this part of mobile users recently United States of America has launched new Mobile Phone case which shields Mobile’s cellular, Wi-Fi and GPS signals and skips location begin tracked. 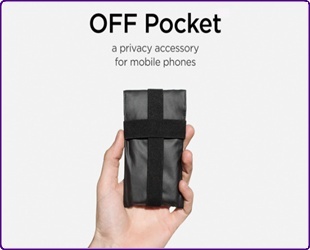 Signal blocking phone case technology developed by New York based artist and Technologist Adam Harvey and named it as ‘Off-Pocket’. The technology behind the electric field blocking Faraday cage protects electrical equipment from lightning strikes as per PopSci. Off Pocket case has water proof, metal fiber mesh 100 times stronger which blocks wireless signals coming from Mobile phone towers, Bluetooth and GPS satellites (frequencies between 800MHz and 2.4GHz).